Chunqiu/Suffocated (Zhi Xi) axeman Kou Zhengyu turns 28 on Friday, and he's celebrating as he has for the past six years by putting on a big Metal fest. Kou's one of the coolest guys and best players on the scene, well loved by pretty much everyone who knows him. See the reminder a few posts down, which has details about our Thursday show at Star Live, which will showcase some of Beijing's Chinese folk-inflected bands. (Spring & Autumn, despite our foundations in Metal, has some discernibly Chinese minzu stuff going on musically). Hope to see some of you at one or both of the shows! Come up and introduce yourselves. And ponder with me if you will the deep mystery of why so many Metal bands insist on rendering their logos in that illegible thorn-like font. 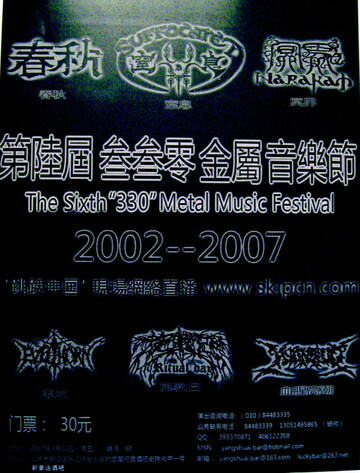 I have no idea what the two of the three on the bottom of this flyer actually say, but the bands--Evil Thorn (there they go with the thorns again! ), Ritual Day, and Bloody Climax are all actually pretty fun. By the way, we rehearsed tonight in a new place in Beijing called Jin Nezha (金哪吒) near Gulou, at 9 Baochao Hutong (宝抄胡同9号). Great place with excellent amps and drums, clean rooms, and only 40 kuai an hour for the big room. Sorry, didn't think to write down the phone number but I'll post it later.